Do you like working on Classic Cars? Would you like a career in the Classic Car Restoration and Customization industry? Due to high demand, we are currently looking for skilled technicians to fill positions, such as: Metal Fabricators, Mechanics, Upholstery Specialist and Body Work and Paint Technicians. If you have what it takes and would like to work in a fun and creative environment, then this may be the place for you. We offer: Vacation Pay, 401K, Life Insurance, Medical and Dental Insurance! We have a 4 day work week schedule! Feel free to come by and fill out an application, email us your resume to: jobs@klassicrides.com, or call us at: 704-483-4826. We pay competative wages based on skill level! There are five important areas to think about before purchasing a classic vehicle. These basic steps will help in selecting the right collectable car for you! 1. Never impulse buy – This has been a mistake with all of us when looking at cars. We see something that we think we need and it ends up becoming a regrettable purchase in the long run. Once this happens we are willing to lose money just to get rid of the vehicle. Always take your time and do not be in a rush to purchase, even if there is a lot of interest in the vehicle. Keep in mind that there will always be another one around the corner. 2. Investment – For ones that are wanting to have a return on their money, or at least break even when they sell a car, it is important to think about how well does the car hold its value and will that value rise over time. This may necessitate doing research on car values and seeing what ones are selling for. 3. Use of the vehicle – Will you be driving the car for enjoyment or will it be a trailer queen? Do you care if it gets driven in the rain? Are you looking for low miles car? Buying a car with a few more miles on it can save some money at the beginning. Also, are you planning on restoring or resto-modding the car? These are all important questions to answer to help in determining the use before purchasing. 4. Research – It good to become familiar with the car you plan to purchase. It would be good to research such items as; VIN number locations, options that were on the vehicle, original components that should be on the car, engine options, etc. Knowing these facts, and what to look for, will save you from having to hunt these items down, which can be costly if they are rare. 5. Inspect the car – Search for rust thoroughly around the vehicle. Check the mechanical and electrical systems, look for any major paint issues, etc. These items can be costly if missed! Contact Klassic Rides today! We offer services to inspect and evaluate a vehicle that you may be interested in purchasing. Many people today think that restoring a car is simply doing paint and interior work. While this is a form of restoration, it is important to understand that restoration can encompass many different levels. If a person were to think of a concours restoration, this is a level of perfection. With a concours restoration a car is brought back to a level that is equal, or exceeds, when the car was new. In concours vehicles, detail is essential to winning in a judged show. It may require a certain type of markings, bolts, or even in some cases a certain way the paint is oversprayed. These type of projects may require a lot of research and hunting of rare parts, depending on the vehicle, which can add to the cost. There are also mid-level or partial restorations, which may include: paint, interior, engine and drivetrain, wiring, or even a brake upgrade. This is usually a good option for individuals who have a nice project, to start with, and would like to choose what items to do, within their budget. With restoring a car there are many different options, so there is no way to lump it all together under one umbrella of just using the word, “restoration”. At Klassic Rides, we like to differentiate the difference for our customers, since the word can mean many different things and can affect the amount of money spent. The question then is, how can you determine what type of restoration services will meet your needs? First, think about your budget and the amount of money that you want to invest into a project. Second, what will the car be used for? Is this going to be a concours vehicle that will be trailered back and forth to shows? If you want to enjoy the car and drive it around, this may help to determine the level of restoration that you will need. For determining what level of restoration that is needed, Klassic Rides would enjoy speaking with you and going over your vehicle to help you in making this decision. Klassic Rides has completed many concours and partial restorations and we have the knowledge of what is involved in doing them. If we can be of assistance in your next project feel free to contact us! 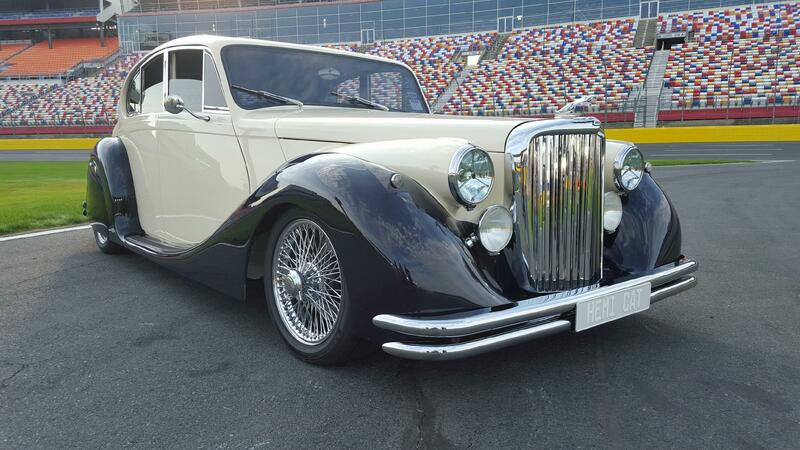 Klassic Rides has turned this 1949 Jaguar MK into a custom project called “The Hemi-Cat”. This is a unique blending of a classic 1949 Jaguar Mark V and a new Chrysler 300-C. This unique custom car utilizes the Jaguar Mark V body, fitted to a Chrysler 300 drivetrain, including a 400 horsepower Chrysler Hemi engine. The Chrysler 300’s wheelbase was similar, but the width of the Jaguar body was widened by about 6 inches. A lot of custom fabrication had to take place, but we tried to do it in a way that would keep the Jaguar features. This was a build in collaboration with legendary NASCAR promoter Humpy Wheeler. The Hemi-Cat, has been featured at “The Good Guys” show in Charlotte. The moment this car rolled off of the trailer it was noticed by the judges and went on to win an award. Humpy Wheeler said, “Klassic Rides, its owners and their people, are among the best restorers and street rod builders in the nation.” For more information on our restoration and customization services, please contact Klassic Rides, LLC.